Where Were the Windows 10 Lock Screen Photos Taken? When is a lock screen more than just a lock screen? When it’s got a really cool picture on it! At least, that’s the intention of the Spotlight feature Cool Things to Do with the Windows 10 Lock Screen Cool Things to Do with the Windows 10 Lock Screen The Windows 10 lock screen is more than a stylish display to cover the login screen. Let us show you everything it can do and how you can customize or disable it. 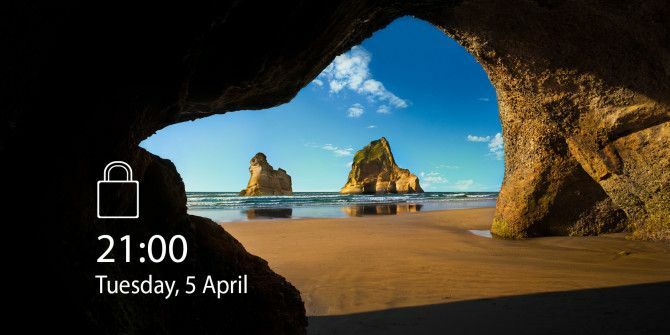 Read More on Windows 10’s lock screen. It shows you some absolutely gorgeous photos, which creates a little extra anticipation when you unlock the computer — what cool photo will you see this time? Have you ever wondered where in the world those pretty pictures were taken? Well, if you have the most version of Windows 10 (version 1607 or newer), then you can check extremely easily. When you’re on the lock screen, you’ll see Like what you see? in the top-right corner. Just hover your cursor over that, and it’ll tell you where it was taken. Simple. If you don’t see this when you mouse over the text, then make sure to run Windows Update How to Find Out Every Last Thing About Windows Update How to Find Out Every Last Thing About Windows Update Once a month on Patch Tuesday, Microsoft releases cumulative updates to all Windows users. We'll show you how to gather information about updates and which Windows Update settings you should be aware of. Read More and get the latest update. What’s the most beautiful Windows Spotlight photo you’ve ever seen? Let us know in the comments! Try the Dynamic Theme app in the Windows Store. You can customize the lock screen AND your background with Bing and Windows Spotlight so that both of your screens have beautiful pictures. rubbish "like what you see" is all take and no give. Good luck with the 'like what you see' option. I have seen a couple lately that point out the photographers Google+, but for the most part, it is non-existent. This is a useless muo guide. When I hover over "Like what you see" it just gives me two options. do I want a new picture or do I want to keep the one that is there. My window 10 is up to date. My windows 10 is up to date but Im not seeing the location of the photo from my screensaver when I hover my mouse at the "Like what you see" field. Please help. I am up to date on all updates. When I hover on that I can tell it that I like it or that I don't like it. If I say "I Like It" it says "Great!" Thats it. so where were the fooking taken?